Irish Eyes is back with a second online slots installation of charm and hidden treasure. This Celtic themed classic is a new and revamped version of the Irish Eyes that captured us all with the ravishing beauty of the beautiful Galway Girl hidden in the 5 reel. Not only this but also the wonderful bonus features as well as the incredible lucky Irish prizes that are available to be won. 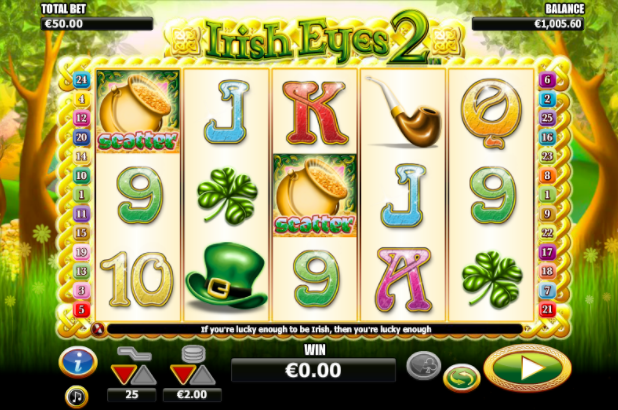 Irish Eyes 2 is a 5 reel, 3-row online video slots game with up to 25 pay lines. The game's backdrop is a stylised forest, with animated shrubberies that sway gently in the breeze, and a barely visible rainbow pulsating in the background. The reels themselves are surrounded by a golden Celtic pattern, and the occasional butterfly will flutter by in front of them. The symbols in the game consist of lower values and higher values. Lower valued symbols include 9, 10, J, Q, K and A. The four higher values are stylised and relate to the theme; A four-leaf clover, a pipe, a leprechauns hat and a gold ring. The game has a wild symbol that can replace any and all symbols in the game excluding th3 scatter. Those who have played the previous game will recognise this symbol as the red-haired girl. The wild symbol in this game is worth 5000x the players' line stake if they manage to lane five on an active pay line. 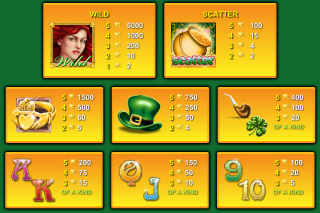 The scatter symbol is represented by the pot of gold and activates the game's main feature. If the player manages to land 3 or more scatter symbols, they will activate the free spins feature; if the player lands 3 scatter symbols, they will gain 10 free spins. Landing 4 scatter symbols grants the player 15 free spins, and if the player lands 5 scatter symbols, they will receive 20 free spins. During the free spins feature all wins are subjected to a 3x multiplier, and it is possible for the player to retrigger this mode by landing another three or more scatter symbols again. The game has a gamble feature that allows the player to gamble their winnings by pressing the clubs/hearts button under the reels. The player will have the chance to double or even quadruple their gambled win by guessing the correct colour or suit of the next card drawn. It is possible to do this up to five times in a row. Irish Eyes 2 is a large improvement on the previous game both visually and fundamentally. The gamble feature helps the player have some variation in gameplay but be warned: gamble too often and your bankroll will be depleted in the blink of an eye. I suggest that players who are not very experienced avoid this function, as it can change a fun game into a nightmare very quickly. As far as creativity and originality go, Irish Eyes 2 is very similar to its predecessor in everything but graphics. All in all, the game is well made and enjoyable, and I recommend it to anyone who enjoys a good, pretty slots game. Now check out our Wild Wild West slot or to discover more easy slot games Click here.